I love sauces! My husband would tell you I could drink them straight from the bottle/bowl or however they’re served. I don’t actually do that . . . well, not on a regular basis! 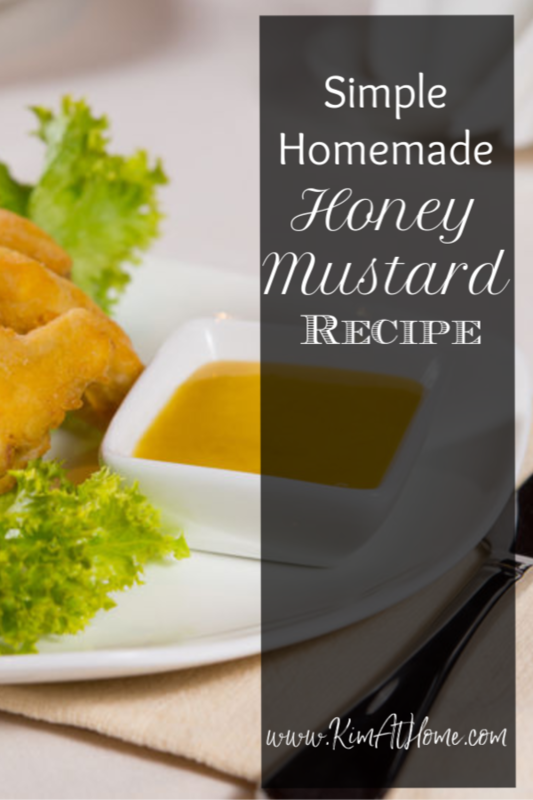 This honey mustard recipe is a favorite of mine! There was this pizza place called Ledo’s that we loved to go to when we lived in Maryland. They had great pizza but they also had chicken fingers on their menu and their honey mustard was the best I had ever had. In fact, I started ordering it when we were just getting pizza and I would dip my crust in it. I also loved to dip day-old cold pizza in it – yum! I wanted this honey mustard all the time, but they didn’t sell it by the bottle. One day, I found Ken’s honey mustard in the grocery store and decided to give it a try. It was the closest I had found to what I could get at Ledo’s. But I still had to buy it at the store which equals higher cost and less convenience than if you can just make it at home when you need it. So, one day I was trying out a new recipe and the sauce had honey and mustard in it. I wondered what would happen if I made some changes to it and, completely by accident since I am NOT chef, I managed to create this amazing honey mustard! Now, its been years since we moved from Maryland had had Ledo’s pizza or honey mustard. But this tastes exactly how I remember it! You can thin it out with a little milk to make it a salad dressing but made just like it is, it makes a perfect dip for chicken, pretzels, or just to eat with a spoon. Yep, I have to admit I’ve even done that a time or two! In a small saucepan, melt butter over medium heat. Stir onion powder and garlic powder when butter is almost finished melting so it cooks over the heat for just a few seconds. Remove from heat and whisk in the rest of the ingredients. The mayonaise and sour cream should cool it down so you can use it immediately. Add a little milk to thin to a salad dressing consistency. Don't melt the butter in the microwave instead of on the stove; it DOES make a difference.